When it comes to the power of the modern Chinese government, there is no feat they cannot do. When you have a limitless supply of labor and a complete willignness to ruin your budget for generations, as China is, you can pull off any crazy feat. For example, China recently built a bridge to connect the suburbs of Qingdao and Huangdao. Building a bridge is fairly easy, except for one key fact: the bridge crosses Jiaozhou Bay and is 26.4 miles long. China has built the world’s longest bridge, the Qingdao Haiwan Bridge, dethroning the 24-mile-long Lake Pontchartrain Causeway in Louisiana as the longest continuous expanse over water. This thing is an engineering marvel. Yes, it took 10,000 workers and $8.5 billion dollars to build the bridge, but China was able to construct the 26-mile span in only 4 years. That’s incredible, especially when you consider how long it takes construction crews to do a simple road resurfacing here in the US. I guess things work a lot faster when you don’t have unions around to slow things down and keep workers from dying. Nice to see they’re willing to use their powers for good, instead of just building stealth fighters, super-fast computers, and missiles. 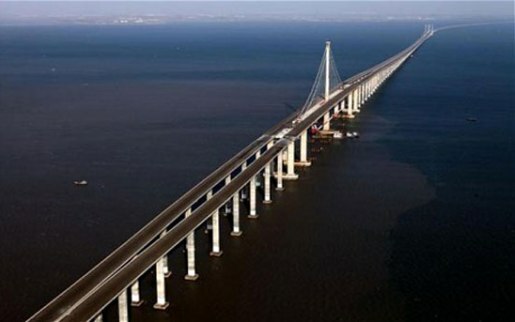 The Qingdao Haiwan Bridge is expected to see 30,000 cars a day. It will shave 20-30 minutes off of the commute between Qingdao and Huangdao. The bridge rests along 5,200 columns and is built to withstand everything from an 8.0 earthquake to a typhoon.